We give away a huge prize every month to one lucky customer with an active server. Check out our competition page to see how it works and look at previous winners. Every single game server you order you give yourself a chance of winning a huge prize. Check out the competition page for more information. Survive The Night servers come with "Game Switching" meaning (if you get bored of Survive The Night) you can change to any other game we host with a few clicks. Download Steam workshop items with our easy to use tool. We make full backups of your Survive The Night server every day, you will never lose data at GTX. Since we only invest in the state of the art hardware to host all of our game servers on you can have trust in us knowing that your server is in the best hand. Couple that with the best support team in the industry not only will you be able to play Survive The Night through the night 🙂 but also 24/7 that's also the hours our support team works. We have a very active discord channel where we have built up a community of gamers who come to chat, meet some new friends and talk everything game related. Your not just getting a Survive The Night game server you're joining a great community of gamers. Don't wait, get your server today or just come and chat with us. Which locations can i choose? Los Angeles, Dallas, New York, London, Paris, Madrid, Stockholm, Moscow, Frankfurt, Singapore, Sydney. Will my Survive The Night server be online 24 hours a day? Yes, your Survive The Night server is always online. That is the main reason to pay for game server hosting. All power and network traffic are covered in your subscription so that your server can be online all of the time. Even when your PC is turned off, your clan or community friends can join your server and play in your absence 24 hours a day, 365 days per year. How are Survive The Night updates handled? If a Survive The Night server update is released all you need to do is click the Steam Update button on our control panel. The server will begin to check your files and update as necessary. This will not affect your world or files. How long do i have to wait for setup? Our servers are instantly setup. Immediately after ordering you can click 'My Services' and get your username and password for the control panel. Once you are logged in your server may still be 'Installing'. This simply means that your server is updating to the latest Survive The Night version via a Steam update. After a minute or two, click refresh on your browser and your server will be shown as 'Running' and will be ready for you to configure with your own server title and admin password. If you ever have any questions about your order open a support ticket. Why do i even need Survive The Night hosting? Well, there are three ways you can host your own Survive The Night server. You could host a server it on your PC, but this means leaving your PC online 24 hours a day which can be costly on power. Also, most connections do not have sufficient upstream to be able to host a decent server. You could rent a dedicated server and host a Survive The Night server on it. This option has some great benefits and we do offer dedicated servers should you go for this option. With a dedicated server, you will get all of the resources focused on one or several servers so you can guarantee the best possible performance. You get root access to the machine so you can easily update the server and run it with a Windows batch file. 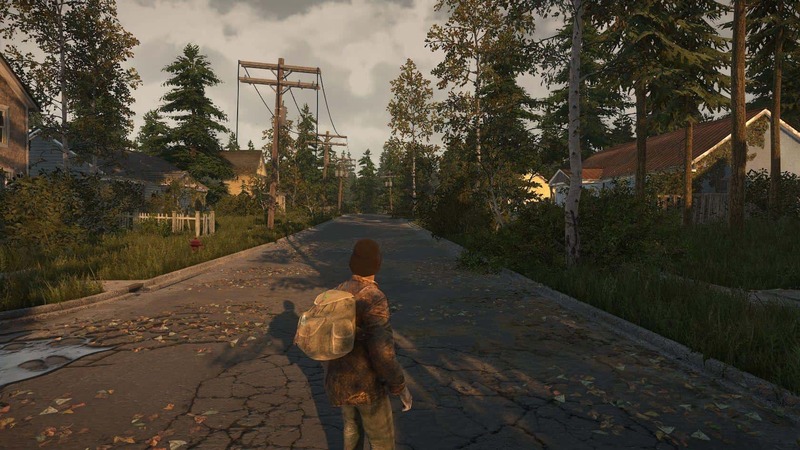 However, on the downside, there is the initial setup of the Survive The Night server which can take some time and expertise to get right, as well as updating it when an update comes out. You would also need to install MySQL and configure it. We do offer a TCAdmin2 license addon which gives you access to our control panel to create servers for only £20 extra per month which will make things a lot easier but with this option enabled you will not get root access (to protect our scripts). The best solution is to rent a server from GTXGaming. Server rental will give you the best value for money. You get the control panel for free, and we host the server 24 hours a day, seven days a week. Rest assured that we do not overpopulate our machines and your server will run as smoothly as if you had a rented dedicated server. There are also added options of high CPU priority too so if your server is bustling with 100+ players you can add this to get things even smoother and with our 24-hour support you can be confident that you can get your Survive The Night server up and running in no time. With GTXGaming Survive The Night servers you get free admin tools to spawn loot, monsters or teleport around. On our servers, you are a god. Get bored with Survive The Night? You can Game Switch to any other game we host with our easy switching tool. Switch back anytime you want. We zip up your Survive The Night server on every reboot and upload it to our offsite backup NAS. You will never lose data at GTX. We hold data from every reboot for 60 days. Our automation means your Survive The Night server will be up instantly no matter what time of day it is. As soon as you order go to the client area, services and get your username and password. 24 Hour no quibble refund. If you order a Survive The Night server from us and are not entirely happy we will simply refund you. With GTX you get full control of your game server via our beautiful web interface. Drop down menus and elegant sliders make configuring your server a pleasure. Experts can utilize our text editors and full FTP access to configure their server manually if they choose. 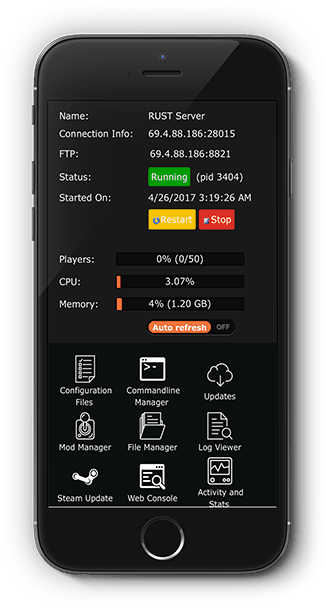 Want a friend to help you manage your game server? No problem, simply create sub-user and give them the permissions you choose. We believe that our hardware is the key to our success, that is why we invest heavily every two years in buying the most up to date processors, SSD drives and memory so that our performance is always ahead of everybody else. As clock speeds for processors increases, we update our entire range with the fastest we can get our hands on. For instance, all new orders in 2017 are being set up on i7 4.2Ghz beasts. Giving your game server the best possible FPS and ping. In all of our machines, we fill them up with RAM so that your game server is never starved of valuable memory. As soon as your server is created it is allocated non-shared memory. For years now all new machines have been equipped with enterprise grade level SSD drives which give outstanding performance and reliability. At GTX SATA is a technology of the past. Survive The Night Game Information. Survive The Nights server hosting will be available from Early 2017. We are anxiously awaiting the release and we will get on creating our trademark amazing server hosting templates and deliver the best hosting experience available. Survive The Nights is a very unique first-person shooter. Encompassing all the very best of survival games, most importantly strategy, creativity, teamwork, and fortification. Build a home base or roam free, it's up to you. All of the structures are accessible and unique. The developers have gone to painstaking efforts to ensure the realism and uniqueness of the structures, unlike other games where the buildings are very internally similar. You can use furniture or wood to block entrances and fortify your structures. Crafting an item combination is an extensive part of Survive The Nights (STN). Combine household items and create weapons or tools. You can also combine parts for vehicles and equipment for those vehicles. Realistic day and night cycles are part of the game. Multipliers will be available for those that want a faster experience. Find diesel generators and light up the night, set traps to protect yourself and survive the night. Food and calories in Survive the Nights are part of the daily grind. You must prevent starvation and if you do not eat for a few days, a risk of starvation becomes an all too real possibility but eat too much and you may become fat and the heavier you then it is likely that the slower you will go. You can trap animals, fish or hunt larger game. Canned goods are also an easy snack but not as fulfilling. There is also fruit available in rare places. You must also consider temperature as it will have an effect. Heat your home or start campfires to stay warm. Your mental health is also something to consider. Being a homicidal maniac could end with your character having a mental breakdown complete with the shakes, blurry vision and voices in your head that only your player can hear. You will require tools to fortify your home base and structures. Maintenance of your machinery is essential to keep them in good working order. 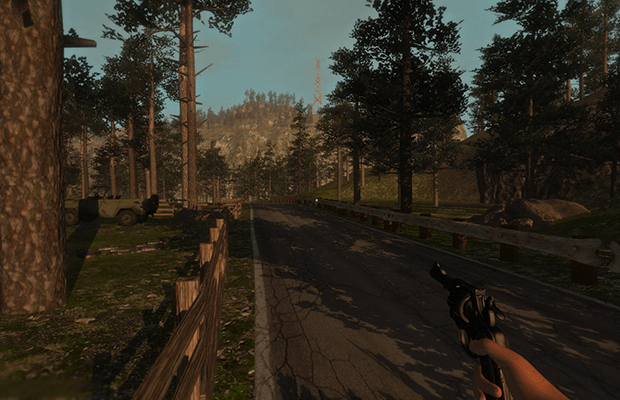 Weapons are in abundance in STN with realistic reloading and gun barrel animations. Vehicles are there but you may need to repair them. You can also use them as mobile camps, carrying all of your prized goods in the trunk. Make sure you lock your vehicle through or bandits will raid it. Off the bat, there will be leaderboards so achievements are recorded on a global server database. Hunting and catching game and small animals, shooting accuracy and carpentry skills all count towards your player XP. Good luck survivalist. GTXGaming makes extensive use of SSL encryption, database password md5 encryption and two-factor authentication across all of its services. Your personal information is 100% safe with us. Support is open 24 hours a day, we are here for you and we pride ourselves on our high level of support and response time. Speak to us on live chat for a one to one. Due to our investment in ownership, rather than renting, we are able to always give more to our customers than the next provider. Low margins and high quality delivered at very competitive prices. We give you extra. © GTXGaming.co.uk Copyright 2007-2019. All Rights Reserved. 10 Years Providing Game Hosting in the USA and rest of the world.